Old School style Tattoos (and Old Skool) become popular in 1920’s. The main characteristics of the old school design are large and bold images made with solid colours and thick outlines in either blue or black. The reason for the big and bold designs can mainly be attributed to the fact that the techniques used to create the tattoos are very different than those used today. Because the quality of the machines and the ink were not very good, the designs were kept simple and bold so they would wear well over time. Another reason that the tattoos were kept simple is that the artists creating them were not highly trained, so keeping them simple produced a better result than elaborate images. A third reason for the boldness of the images was the stencils. Back then the design would be cut into acetate and powdered charcoal would be rubbed into the etching before being applied onto the skin. The charcoal very quickly smeared so a simplistic design was essential. 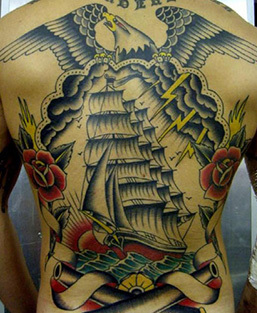 The father of the old school is definitely "Sailor Jerry" Collins, who enlisted in the U.S. Navy at an early age and became familiar with the art of tattooing during his travels through to Polynesia, where tattoos were already very common. Later, the young man moved to Hawaii, where he opened a tattoo shop that quickly became a favorite destination for sailors who crossed those waters. There are many symbols used in Old School Tattoos ( you can view a large selection from many of our artists here: old school tattoos ): the most popular designs include patriotic symbols, birds, pinup, ships, snakes, anchors, hearts, daggers, pistols, starfish, Dari, roses, cherries and mermaids. 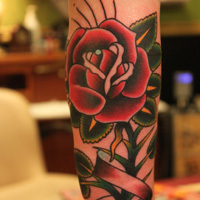 The rose tattoo is quite simply a classic design with a simple meaning, love true. The rose is often seen alone as well as with other images such as daggers, skulls and birds. 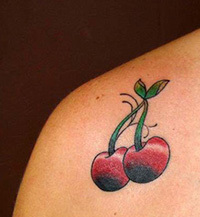 The Cherry tattoo is another very popular choice especially in rockabilly scenes. The cherry symbolizes lust, fertility and sexuality, and a clear message that seems to say, "hey, pick me, I'm ready to ... "
The dagger symbolizes justice, war and death. 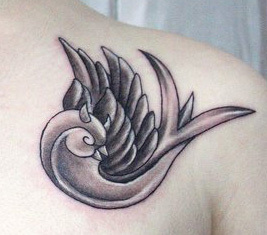 A popular location for this tattoo is on the forearms of military personnel. In ancient times the dagger was the last line of defense, after guns, swords and heavy weapons this tool was the last resort before the final surrender. 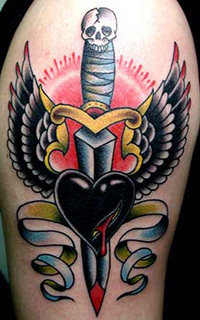 The dagger symbolizes a warrior ready for anything, ready to fight to the last breath. The meaning can vary depending on the combination with other images such as heart, skull, snake or pink rose. The dice game is very popular around the world and particularly popular with Asian cultures. Its meaning is clearly to do with luck and changes according to the numbers you want to appear. For example, if the score is 2 (as the snake's eyes ) it indicates bad luck, if the combination shows 7 it becomes a symbol of luck. 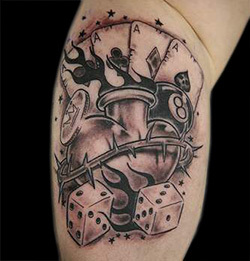 The image of a dice is often combined with other images such as flames and pinup girls. Heart tattoos typically contain a name such as Mum or the name of a loved one. The meaning speaks for itself. This symbol is often used to remember a lost love. Mermaids are mythical creatures known for their ability to attract sailors with their beauty and destroying their ships on the rocks. This image symbolizes the power of feminine energy and the danger of losing everything because of the lust and lure of a woman. Nautical stars are usually represented with 5 points with shades of light and dark. Traditionally stars are associated with old school sailors and the symbols are often accompanied by a rose, a compass and other nautical instruments. Stars represent the sailors ability to find their way home, a bit like the compass would . However, it is one of the lesser-known symbols used just for its meaning and is often used in conjunction with other popular old school images. 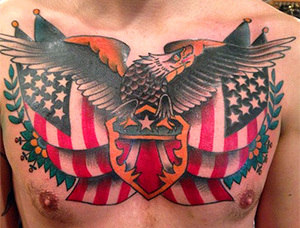 The subject matter of patriotic tattoos are numerous, popular images include flags and military emblems, all aimed at representing a person’s attachment to their nation. Their popularity exploded during the First and the Second World War when they were used to indicate hope and a desire for war to be avoided. Ships represent freedom and a spirit of adventure. These ships have nothing to do with the modern Navy ships, sailing ships are normally depicted that are beautifully rich in color. 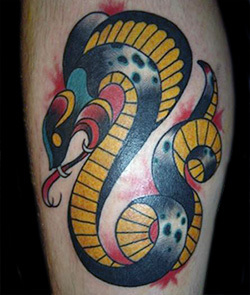 The serpent is a popular symbol among many cultures around the world. Old legends from around the globe have the serpent as the protagonist; the Bible itself gives the reptile a key role in the creation of humanity. The snakes meaning varies according to culture, it also represents the thin line between life and death. Due to its ability to change its skin this symbol can mean a rebirth or the start of a new life. 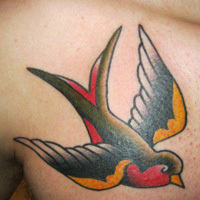 Sparrow tattoos are in no means as common as the swallow but is one of the few birds that indicates a companion for a lifetime, in fact, the swallow is rarely seen depicted alone. Two sparrows represent eternal love between lovers who have been together forever. As well as indicating long lasting love, in the case of those who have been incarcerated it indicates freedom after years of imprisonment. In the nautical world swallows indicate luck: when this bird is sighted from a boat it indicates that there is land nearby, it is also a bird known to always be able to find its way home after a trip. 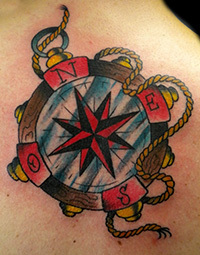 This symbolism is the reason that it is one of the most popular tattoos used by sailors. 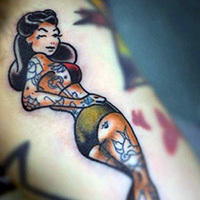 This images has no specific meaning, however it is one of the most popular old school tattoos. 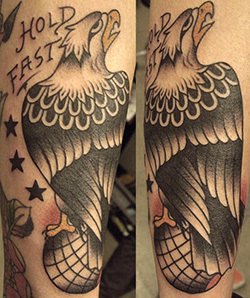 A tattoo of an eagle is a popular symbol to represent being patriotic to the world of the U.S Navy. This image represents courage, honor, friendship, power, freedom and strength. For Native Americans the eagle represents grace and the balance between heaven and earth and has a deep spiritual meaning : the eagle flies close to the sun , the creator, who dominates the earthly lives . Visit the Old School Tattoo Gallery of our artists.